Apple devices have seen huge adoption rates across various verticals from marketing, financial, construction, to primary schools and higher education. These companies and schools choose to implement Apple for a wide variety of reasons, including security and durability. Not to be outdone, healthcare organizations are taking a page from these enterprises and welcoming iPad, iPhone, and Mac at clinics and hospitals around the world. What’s causing this shift in healthcare technology? Let’s take a look. With its roots in transforming mobility, iOS is rapidly becoming the platform of choice in healthcare. Why do healthcare organizations like iOS? Apple’s mobile operating system boasts an intuitive user interface, a secure ecosystem of business-ready apps, and built-in tools that empower users to be more productive than ever before. iOS is the only platform that is designed for consumers and embraced by the enterprise. It includes the fastest and most efficient mobile hardware, has native encryption built-in, and works with all modern secure networking protocols—including VPN and single sign-on. Healthcare organizations are required to meet certain security standards when it comes to protecting patient information. In the United States, this is know as HIPAA. Other countries have similar data protection laws. If a healthcare organization wants to use iPads, they need to ensure certain security controls are in place first. These security settings can be defined and enforced through the mobile device management (MDM) framework that Apple has built into all iOS devices. MDM allows an organization to build configuration profiles and deploy them to Apple devices. These profiles can require the device to have a passcode, join the hidden secure Wi-Fi network, auto-populate VPN settings, and much more. Organizations can even hide unwanted system apps (like the Camera or Notes app), set the wallpaper, and define the Home screen layout to create standardized devices. With these security controls in place, inventory data of the device is sent back to your management solution via MDM and can be monitored. Inventory alerts can be created to look for devices that are out of compliance. If a device doesn’t meet security standards, an alert is sent to IT and action can be taken, such as reapplying the security profile or remotely wiping the device. This ensures your devices always meet regulatory standards. Once healthcare organizations are able to secure devices, they can focus on why they invested in technology in the first place—to improve the patient experience. 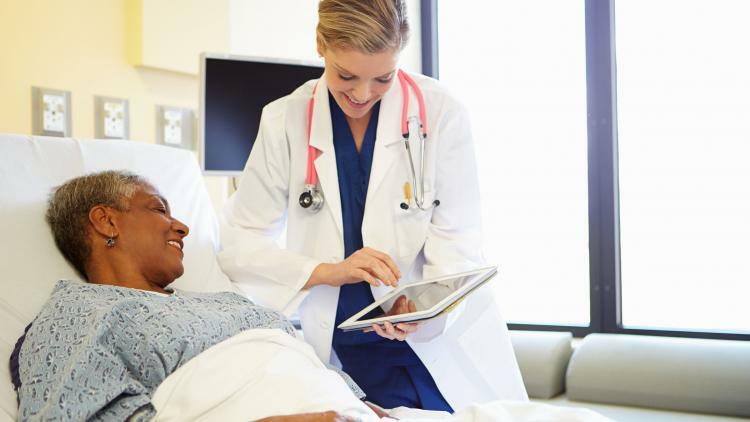 A good bedside experience should include easy setup of devices by caregivers, secure access to electronic health records, education and entertainment available to patients, and the ability to securely reset iPads between patients. Thanks to Apple’s Device Enrollment Program (DEP) and MDM, caregivers don’t have to worry about manual setup of devices. A factory reset iPad will automatically enroll into your management solution and grab all the device settings, apps, and security controls needed for a new patient. Caregivers no longer need to spend valuable time setting up devices. The iPad can then be assigned to the patient for their stay and loaded with apps to keep them informed and entertained. Once a patient checks out, the iPad can be remotely wiped—removing all patient data—and reset to factory settings; readying the device to be automatically setup for the next patient. Configure, deploy, wipe, repeat. Now, thanks to the Casper Suite (if that’s your management solution), your iPads can be digitally sterilized between every patient. Because of Apple’s great iOS devices, a wealth of health-related apps, and the Casper Suite as your MDM solution, healthcare organizations can ensure devices are secured to meet regulatory standards and enhance the patient experience. Watch our video to learn more about implementing Apple in healthcare. Don’t have the Casper Suite as your management solution? We can fix that. Email us or give us a call today.